? 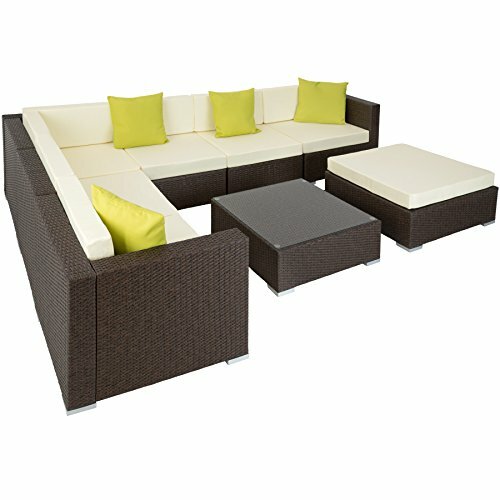 Description: • High quality wicker furniture in modern style. • Suitable for garden, balcony, terrace, lounge or conservatory • Soft, detachable seat cushion for optimum comfort, about 10 cm upholstery thickness. • Table with glass surface. • Easy to clean • Including clips to keep the individual seat elements together. • Aluminum frame • 4 extra pillows ? Technical specifications: Stool: • WxDxH: approx 75 x 75 x 38 cm including padding. • Weight: approx. 3 kg Armchair • WxDxH: approx.64 x 75 x 60 cm • Weight approx. 4,7 kg Corner armchair: • WxDxH: approx. 75 x 75 x 60 cm • Weight: approx 6,6 kg Table • WxDxH: approx. 70 x 70 x 28.5 cm • Weight approx. 8,7 kg Upholstery: 100% Polyester has cushion thickness of about 10 cm Weight: approx 45.6 kg ? Delivery includes: • 3 armchairs • 3 corner armchairs • 4 extra pillows • 1 stools • 1 table with glass top • Illustrated assembly instructions and assembly set and clips ? DISMANTLED GOODS | KIT base made of aluminum - no rust! To ensure maximum enjoyment of our product when used outdoors, we recommend using a protective cover to protect against material fatigue and discolouration.